I am so excited to bring you a wonderful interview with the very talented Ciji Ware, author of Island of the Swans, which you can read my review for here. Thank you Ciji for your thoughtful answers and honoring "Confessions and Ramblings of a Muse in the Fog" with your presence. What inspired you to write about the Duchess of Gordon? I hail from a long line of professional writers, including my father, Harlan Ware, who was a mid-century popular fiction author, screenwriter, and a co-writer of a (now) long-gone radio show called One Man’s Family. His office was across the hall from my bedroom and I would wake up to the sound of him pounding on the typewriter from about 5am. I think I absorbed early on that writing as a profession—not a hobby—took the discipline of putting one’s seat of the pants onto a chair early in the day and one’s hands on the keyboard! We had always, therefore, been big readers in our household, and my dad would take me with him to a wonderful local bookstore where he’d hang out with the owner, and I’d head for the children’s section to read as many Nancy Drew mysteries as I could during the time we were there. Later on, I discovered the writers Daphne du Maurier and Anya Seton, and thrilled to such historical novels as The French General and The Winthrop Woman. Dad and I loved going to see swashbuckling films like The Man in the Iron Mask and The Three Musketeers. Given my love of history (I majored in it in college); my enthusiastic response to those glimpses of eighteenth century life I saw in all those Errol Flynn films; and the enthusiasm my dad had for “the rich, full creative life” as he called it, I somehow always knew I’d get around to writing books—but only after I made a living as a TV-Radio news reporter and commentator for ABC in Los Angeles, so I could pay the bills. The final push toward writing my first novel came when I stumbled across a monograph about “The Match-Making Duchess”—Jane Maxwell, 4th Duchess of Gordon, whom my very dotty great-grandmother claimed was our ancestress. When I hit forty, I spent five years in my off-camera hours researching and writing the book that eventually became Island of the Swans. I could never prove without a doubt I was from the branch of the McCulloughs of Gatehouse of Fleet (in Ayrshire—the poet, Robert Burn’s territory) that had, indeed, married into the Maxwells of Monreith a few generations before Jane was born. However, I had a wild ride trying to trace the links and got a novel out of the process—which, when it first came out, I would promote at author conferences and speaking engagements dressed in full duchess regalia! What do you think the marriage would have been like for the Duke and Duchess of Gordon if Thomas had not been in the picture? This is such a fabulous “what if” question, and one I’ve thought about for a long time. 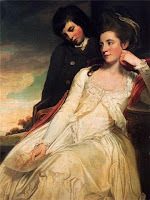 The Duke and Duchess of Gordon are, of course, historical figures who lived in the second half of the eighteenth century and into the early nineteenth. That there was a love triangle that went on for nearly three decades between Alexander, Jane, and her childhood love is not in doubt, with very strong evidence in the historical record that one of Jane’s seven children was not by the duke. From the few family letters that still exist, I think that had Thomas died—as was thought he did for a year—in the Scottish kilted regiment skirmish with Native Americans outside Fort Pitt in Pennsylvania, Jane and Alex would have had a quite exemplary marriage, for I believed love truly existed between them in the early part of their marriage. Remember, however, that theirs was a “dynastic union” to begin with—with Jane’s mother, an impoverished member of the minor nobility anxious for her daughters to “marry up” and improve the Maxwell standard of living. They had all the makings of an extraordinary union. Alex was a remarkably handsome man in his youth; Jane, a beauty in her day (seen here helping Alex and her brother recruit troops in the Scottish Highlands to fight for the British in the American Revolution)…and together, they were a “Power Couple” on the order of Brad Pitt and Angelina Jolie. Jane loved politics and policy debates and became Prime Minister Pitt, The Younger’s social hostess on London, as he was a bachelor. Alex was the largest landowner in Scotland, an ardent music lover, and wielded tremendous power as an aristocratic. Without the divisiveness of Jane’s virtual inability to forget her love for another man, I think history, today, would be more aware of their contributions to eighteenth century society. I love the rivalry between the Duchess of Gordon and the Duchess of Devonshire. Who do you think was the greatest Duchess and why? Many of us have read the book and seen the movie about the life of the Duchess of Devonshire, Jane Maxwell’s rival. The Duchess of D supported the Whigs of James Fox retinue; The Duchess of G supported the King, which meant she was a Tory. One of the most significant contributions she made during the so-called “Madness Crisis of George III (see the film where Helen Mirren played poor Queen Charlotte) was to have been instrumental in finding a doctor who didn’t believe in using leeches and horrible, dangerous “potions” such as mercury when treating ailing King George. The king wasn’t mad at all, but had a disease called porphyria that caused seizures during which he appeared to “rave.” Once the new doctor stopped the brutalizing treatments he’d been getting, he made a recovery and remained on the throne for another few decades. Trust me, what those earlier doctors had done to the poor king would have driven any of us mad! At any rate, Jane, I believe, is the far better duchess because she truly had the public’s good in mind as a driving principle for her life’s work. Georgiana, on the other hand, was an addicted gambler, drinker, and very public about the messiness of her private life. Jane, whose life also had its chaotic moments, was known not only for her life in the politics of the day, but also for her efforts to provide employment on her husband’s vast lands in northern Scotland through sheep raising and weaving industries that discouraged the wholesale departure to the New World of local inhabitants—a practice that bled Scotland of so many of its “best and brightest” between about 1775 onwards. What was your opinion of Alexander Gordon as you researched and wrote about him? e.g. Should he be pitied for his jealous nature over his wife or did he cause himself a lot of grief by not accepting his wife for who she was, was the Gordon madness a cause for some of his problems etc.? Alex was a product of his breeding and the times in which he lived. He was “to the manor born”—a bit arrogant and certainly accustomed to having his own way. As he grew older, his good looks disappeared, and his unhappiness was written on his face for everyone to see. Sadly, his father had died when he was fairly young and he also had a very dominating, controlling mother who was fearful she would somehow be left in the dust. She married the second time to an American –not much admired in those times—and was constantly maneuvering to get her slice of the ducal pie! Alex was, of course, perfectly sane. The Gordon Madness--which had run through the family for generations due to the fact that aristocrats intermarried far too frequently--always shadowed him throughout his life and made him, I believe, reluctant to take a very public role in the House of Lords. He’d show up for sessions, but rarely took a position of prominence. Any little unusual response or action and the tittle-tattles of the day would pounce on it as “evidence” the duke was affected by the family blight, as his brother Lord Gordon certainly was. It must have been an awful burden to live with. Alex had many honorable qualities, but his background and the events of his life took him down a road where he simply couldn’t give his wife Jane her due, and in fact, the evidence indicates that he felt increasingly over the years that her gain was his loss in terms of honor, accomplishments, and status. If Jane and Alex could only have rowed their boat in the same direction, I’ve always wondered what amazing things they could have accomplished together, and I think theirs would have been one of the great love stories of all time. Alas, fate, and the vagarious of the heart determined it would not be so…. Any advice or suggestions for aspiring authors? Sourcebooks is republishing all five of Ciji's historical fiction novels. The next one being Cottage by the Sea, available June 2010. Ciji's is currently working on A Race to Splendor, which will be set in 1906 after the great quake in San Francisco. It will be her newest historical fiction novel in ten years; with an expected release date of April 2011.